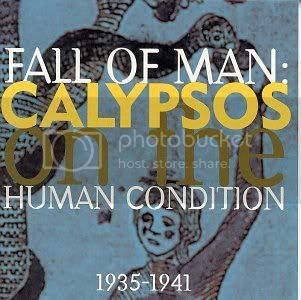 I was downloading "Top Calypsoians" from Schadenfreudian Therapy (http://baikinange.blogspot.com/2008/09/top-calypsonians.html), and in her post she mentioned this CD. I forgot I had it so I decided to post it and share it with the world. This is volume 1, and as far as I know there never was a volume 2, so we got HOODWINKED!!! Ice Records was putting out good calypso comps back in the day WTF happened??? 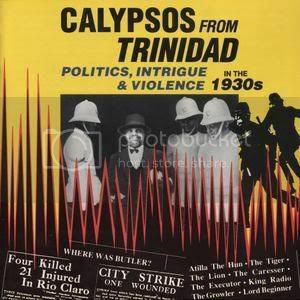 Songs about British royalty, American movie stars and singers, of local politics, sporting events and disasters all vie for attention in the calypso song. Enormously popular during the 1930s, today these songs are a window on a specific place and time, mirroring contemporary attitudes towards international events. But more than that, these songs are charming, clever, philosophical and funny, possessing a sophisticated (and often biting) wit. Several of the songs heard here were revived in the '70s by such artists as Ry Cooder, Van Dyke Parks and others. With Wilmoth Houdini, Lionel Belasco & His Orchestra, Atilla (Atilla the Hun), Tiger, Lord Beginner, King Radio, Lion, Caresser, Executor, Growler, Black Prince. This album features insouciant, trenchant, and politically incorrect commentary on the war of the sexes, clothed in jaunty rhythms and with tongue firmly in cheek. The lyrics are placed in the few melodies used by all performers in the 1935-41 period covered by the CD. The great names of the "golden age" of Trinidadian calypso are represented - Tiger, Attila, Lion, King Radio, Growler and others. The accompaniment features piano, horns, violin, bass, and trap set, contributing jazzy instrumental interpolations on the generous 23 selections included here. This collection of treasures from the Smithsonian, other archives, and commercial studios transformed a series of tracks by the set's producers into a heady taste of carnival through the decades. 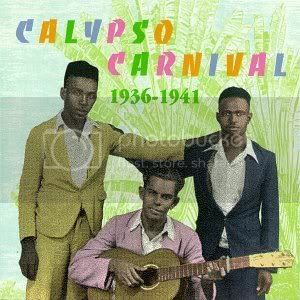 Calypso Calaloo is actually the aural accompaniment to Donald R. Hill's written volume Calypso Calaloo: Early Carnival Music in Trinidad, a fascinating account of that island's music pioneers, its world-famous annual carnival, and the culture that spawned it. This is an expanded version of the lp "Where was Butler" posted at (http://listentoyourears.blogspot.com/). My man YO YO posted the lp version which has 16 tracks, but I am posting the CD version which has 24. 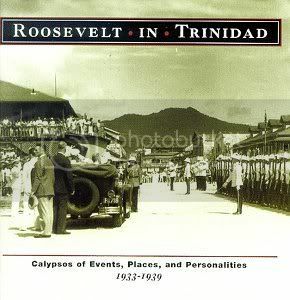 This socially-conscious collection draws upon the first few generations of calypsonians, with a special emphasis on seminal figures like Atilla The Hun, The Tiger and Lord Executor (who reportedly made his debut in 1897, and remained on the scene for another six decades). Their concerns are local ("Shop Closing Ordinance"), international ("The Gold in Africa,") specific ("The Rats," which describes the practices of local prostitutes) and sweeping ("Money Is King," which takes social inequality for its subject). A great many concern a 1937 strike by workers in Trinidad's oil fields, which created a viable labor movement, and resulted (eventually) in the end of colonial rule. The jazz-inflected arrangements are dated, but still delightful ("Down the Road" is almost an anthem). The lyrics have lost none of their bite. This is an expanded version of an earlier LP that was posted at (http://listentoyourears.blogspot.com/)with an assortment of Houdini's recordings with string band, tamboo bamboo, and a small 'Jazz' orchestra (Gerald Clark's Night Owls). The LP was released in 1984 by Arhoolie Records, then re-released by Arhoolie on CD under the title Poor But Ambitious in 1993 with an additional eight tracks that Houdini recorded in the mid-'40s added. Most of this was recorded by Alan Lomax in Trinidad in 1962, with a traditional-styled band backing Marcano with flute, fiddle, guitar, bass, and percussion. It's pretty well-recorded, Marcano is in good vocal form, and the band has a fine loose, informal vibe. This largely sticks to songs about romance and gently moralistic tales, getting into more serious territory with "War" (sung with Lord Iere and Indian Prince), with its references to the atomic bomb. The tunes have Marcano's trademark minor-key melodies, yet they're sung and played in a jovial style that makes them rather uplifting. Two tracks recorded at the 1966 Newport Folk Festival -- Marcano talking at length about calypso music, and an a cappella "Atomic Energy Calypso" -- are tough to enjoy because of the mediocre fidelity and dry unaccompanied vocals. In 1977, American calypso enthusiast, Steve Shapiro visited Trinidad and sought out Tiger who had long since retired and was presumed to be dead by most people. Shapiro prevailed upon Tiger to do a modern recording of some of his finest works in their original style. 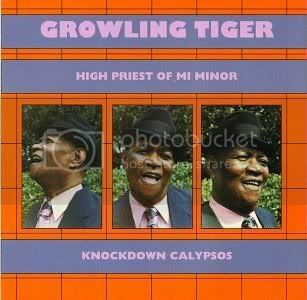 At sixty-four years of age, Tiger had lost none of his prowess and the resultant 1979 album titled, KNOCKDOWN CALYPSOS on the Rounder Records label later earned a Grammy nomination. The Growling Tiger performing in a nightclub. New York, 1945. 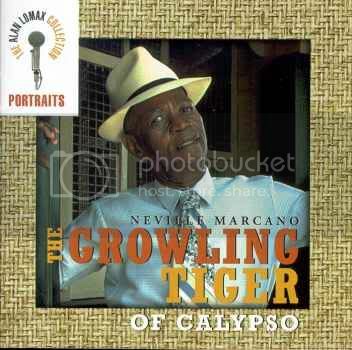 Growling Tiger is in top 5 favorite Calypso Singers. Twenty-five classic performances from the golden age of Trinidadian calypso. 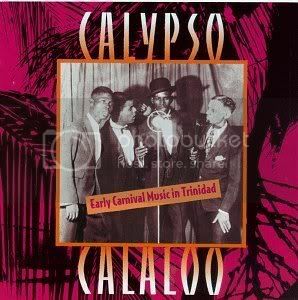 This was my 1st Calypso CD that my father ever bought me. I remember getting it for Christmas and listening to it all day long. That was in either 1993 or 1994. A companion volume to "Calypso at Midnight", featuring a transcription of a radio performance from 1946. While some of Alan Lomax's recordings function best as museum pieces, these performances are great fun. Lord Invader, Duke of Iron and Macbeth are on hand with their orchestras. Alan Lomax serves as MC. 5. Introduction to "Ugly Woman"
This calypso concert, sponsored by People's Songs and hosted by Alan Lomax, was performed in December 1946 at New York's Town Hall during the post-World War II calypso boom in the United States. 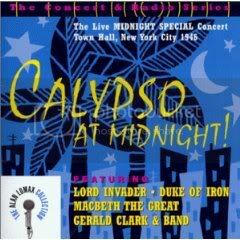 Three of the greatest New York-based calypsonians, Lord Invader, the Duke of Iron and Macbeth the Great, are accompanied by Gerald Clark & his Invaders, performing a mix of well-known and, especially in Invader's case, original material. These CDs are a sentimental journey back to an historic performance of early calypso in the U.S. and back to the era when progressive politics and folk music were joined. Make Sure You Get Your Ticket For The Show!!! 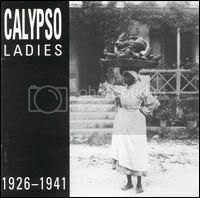 This calypso concert, sponsored by People's Songs and hosted by Alan Lomax, was performed in December 1946 at New York's Town Hall during the post-World War II calypso boom in the United States. 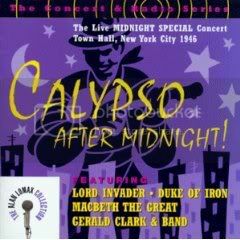 Three of the greatest New York-based calypsonians, Lord Invader, the Duke of Iron and Macbeth the Great, are accompanied by Gerald Clark & his Invaders, performing a mix of well-known and, especially in Invader's case, original material. These CDs are a sentimental journey back to an historic performance of early calypso in the U.S. and back to the era when progressive politics and folk music were joined. 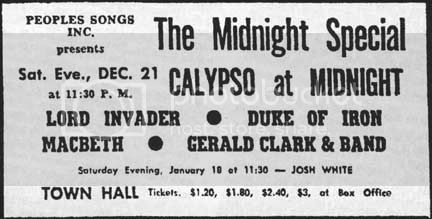 Part of a series of concerts (Blues at Midnight, Ballads at Midnight, etc.) staged between 11 p.m. and 1 a.m., which offered a lively after-theatre destination for New Yorkers, this was no ordinary set. Here is a sweeping overview of the many forms of Trinidadian folk music performed live in concert. Lord Melody (1926 — 26 September 1988) was a popular calypsonian, best known for singles such as "Boo Boo Man", "Shame & Scandal", "Jonah and the Bake", "Juanita" and "Rastaman Be Careful". Melody's career spanned some forty years, from the early development of popular calypso to his embrace of a reggae influenced sound in the late 1970s. 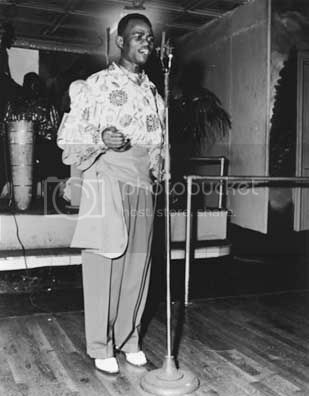 He was one of six calypsonians who were chosen to sing for Princess Margaret at the Governor's House during her visit to Trinidad in 1956; the others were Sir Galba, Mighty Dictator, Mighty Spitfire, Mighty Panther, and Lord Viper. He frequently sparred in song with the Mighty Sparrow on this topic. Rivalry between Melody and the Mighty Sparrow was recorded in the calypsos "Ten to One is Murder" and "Sparrow Have a Gun". The humorous rivalry between the two calypsonians was immensely popular with audiences. Another one of Melody's calypsos, "Shame & Scandal" (composed in 1962), became an international hit and was recorded in the U.S., Europe and Australia. 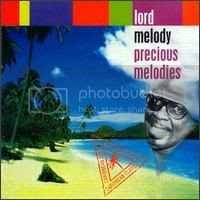 Lord Melody died from cancer in September 1988, in Port of Spain.